Rosencrantz and Guildenstern can't figure out what's behind Hamlet's odd behavior, but tell Claudius and Gertrude that he was excited by the arrival of the players. The King and Queen, hopeful that Hamlet is improving, agree to watch the play. Rosencrantz and Guildenstern exit. Gertrude leaves as well, since Claudius and Polonius have chosen this moment to set up the "accidental" meeting between Hamlet and Ophelia. 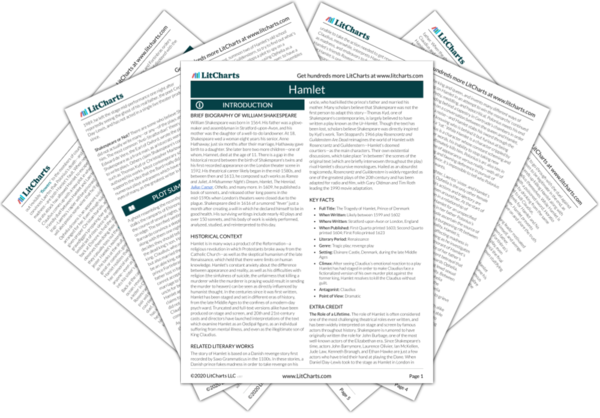 While Hamlet is searching for evidence about whether Claudius killed Old Hamlet, Claudius is seeking evidence about what's bothering Hamlet. Polonius tells Ophelia to walk in the courtyard as if reading a book. He muses that people often use appearances to "sugar o'er the devil" (3.1.47). Polonius muses on appearance vs. reality, and is sure he can tell one from the other. Claudius, struck by Polonius's words, mutters an aside about a "deed" that his "painted words" (3.1.52) can't hide from his conscience. They hear Hamlet coming and hide. Claudius privately admits his guilt, proving that in fact Polonius can't tell appearance from reality. In a soliloquy, Hamlet agonizes over whether to kill himself: "To be or not to be" (3.1.55). He thinks men would almost always choose suicide over the "slings and arrows" (3.1.57) of experience, except that they fear what might happen in the afterlife. He observes that such thinking turns people into cowards, and action into inaction. Suddenly Ophelia enters and tries to return the gifts Hamlet gave her. He denies having ever given them. Hamlet tries to think through his wish for death, his fears about the likely unfairness of the afterlife, and his inability to act. But before he can find a solution he sees Ophelia—a woman. Hamlet asks Ophelia if she's honest, then says beauty corrupts honesty. Becoming angry, he tells Ophelia he loved her once, then says he never loved her. He commands her to go to a nunnery rather than become a "breeder of sinners" (3.1.120), and says all men, including himself, are "arrant knaves" (3.1.127). He condemns women for hiding their faces behind makeup. Then states that there will be no more marriages—and that one person who's married already will die. Hamlet storms off. Ophelia is heartbroken. Hamlet's hatred of women seems to have made him self-destructively crazy. (Here he reveals his plans to kill someone!) In particular, Hamlet hates that women hide the reality of their faces behind makeup: it makes beauty dishonest, hiding age (and death) behind a pleasant mask. Claudius, from his hiding place, decides that Hamlet neither loves Ophelia nor is he mad. Instead, he thinks Hamlet is "brooding" on something, and that this brooding will lead to danger. He decides to send Hamlet to England. 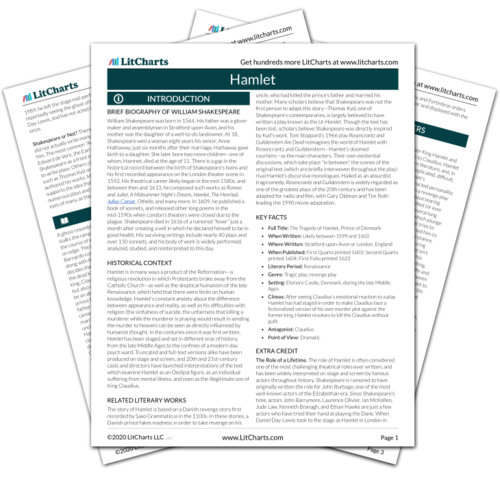 Does Claudius suspect Hamlet knows something about the murder? Whether yes or no, he wastes no time in acting. Polonius still thinks Hamlet loves Ophelia. He requests that after the play Hamlet be sent to talk with Gertrude, where Polonius will once again spy. Polonius cares more about confirming his theory than comforting Ophelia. Florman, Ben. "Hamlet Act 3, scene 1." LitCharts. LitCharts LLC, 22 Jul 2013. Web. 19 Apr 2019. Florman, Ben. "Hamlet Act 3, scene 1." LitCharts LLC, July 22, 2013. 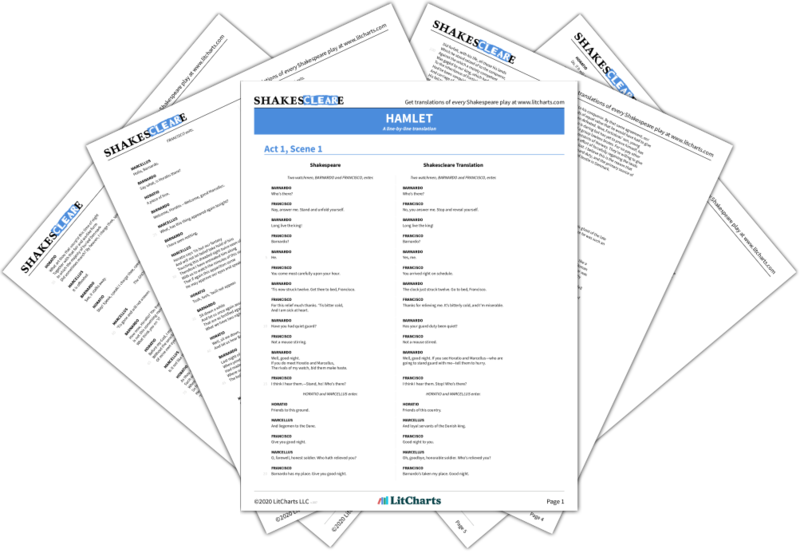 Retrieved April 19, 2019. https://www.litcharts.com/lit/hamlet/act-3-scene-1.